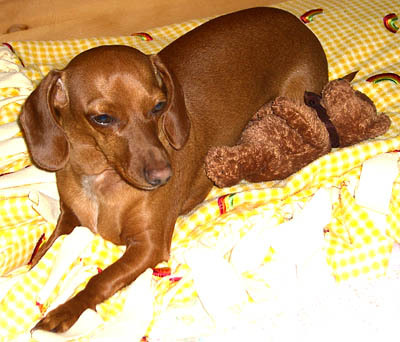 Mini Dachshund Gets a Night Night Bear! The other night we (me, Mommy and Pop Pops) all went upstairs to go to bed as usual. The end of another Dachshund day. Everything was going as it normally does when all of a sudden, Pop Pops presented me with a new Bear! OMG! This mini Dachshund was so excited, I grabbed it in my mouth and was shaking my head back and forth. My Dachshund tail was just out of control, wagging back and forth with such eagerness, Pop Pops knew I was ready to play. Then Pop Pops tried to take it out of my mouth so I gave him the Dachshund ‘look’. You know, that ‘don’t you try it’ look as I stare at him out of the corners of my eyes, the whites of my eyes glaring with mischief. Of course we were just playing. He took the bear and then I took it back. We played for what seemed like hours until I got tired and decided to settle down and snuggle with my new toy. We all decided to name him Night Night Bear. Pop Pops tries to hide Night Night Bear under the covers or the pillows but I always find him! You can’t fool this Dachshund! Night Night Bear is smaller than Girlie Girl, probably half her size. He is brown and very soft. Night Night bear is almost the exact same color as me. I am a red smooth coat Dachshund. Girlie Girl sleeps with me on the couch and Night Night Bear sleeps in the bed with me at night!